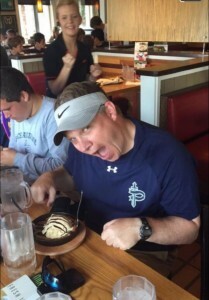 Mr. Fleming shows that he is capable of good times at a local Chili’s restaurant. As the Class of 2016 graduates, this school year will go down in the record books. With many outstanding students, state champions, artists and performers, Pace will miss this group of individuals. Along with the students, one man stands out: Brooks Fleming. Mr. Fleming has been the dean of the 2016 class for their entire journey through high school. “Throughout our four years, Mr. Fleming has helped me and the whole grade with academic advice,” said senior Johnny Reece. Whether problems arise through bad behavior, schedules or a simple conversation, Mr. Fleming always has an open door policy. “As dean, I know I need to be able to help everyone, and that is why I encourage people to come in and talk,” said Mr. Fleming. The seniors have developed a special relationship with their dean, as evidenced by the banter they often share together. “During our spirit week video, we thought it would be good to poke a little fun at “Flemdog” with our joke about seeing President Snow for two minutes,” said senior Frances Crisler. Along with the video, Mr. Fleming decided to step up for Freestyle Friday, which no one will ever forget. “Freestyle Friday was just a bit of a joke for me, and I thought not only our senior class would enjoy it, but also everyone at the school,” said Mr. Fleming. In addition to his responsibilities as dean and English teacher, Mr. Fleming is the head varsity boys soccer coach. “The soccer expertise he brings every day in practice helps our team get better and better as we continue in the season,” said sophomore Ethan Much. Mr. Fleming helped guide the team to a 14-0-1 record this year, as the Knights head toward the final four. Once this class graduates, Mr. Fleming will step down as a dean, and history and Latin teacher Grady Stevens plans to take over the rising ninth grade. “I will miss him when I go to Mercer, but I know my lax coach, Grady Stevens, will fill his shoes well next year,” said senior Jean-Luc Brown. With a young son, Sawyer, Mr. Fleming will have more time to focus on rearing his young progeny instead of shepherding a class of 120 high school students.